Accuracy of ±0.5°C, Sampling Rate 5HZ. More information about how Fibre optic sensors work in this link. The HHTFO-101 offers impressive versatility. Battery operated for maximum user freedom, this single-channel instrument allows you to freely move from one area to another to measure temperatures at various critical sensing points. The HHTFO-101 runs on standard “AA” type alkaline or rechargeable batteries, providing power for at least 5 hours of continuous use. It also comes with a universal power supply. The HHTFO-101 comes with a built-in flash card data logging feature allowing user to save collected data directly onto a high capacity SD flash card. SD cards of up to 1 GB capacity are supported. The data can be accessed through any PC equipped with a flash card reader. The HHTFO-101 also features the SnapLog feature which allows recording of 1 temperature point with time stamp every time the SnapLog key is pressed. The HHTFO-101 features a 160 x 160 pixel LCD display with a LED backlight. It provides celsius or fahrenheit temperature readings that are well contrasted in any condition. The HHTFO-101 icon-driven user interface is built around a 6-button ruggedized keypad. All functions are accessible through the display menu, including data logging on SD card, instrument setup and configuration, and expert mode. Datalogging sessions can also be viewed directly on the display. This multi-purpose instrument comes with a built-in RS232 port for remote interfacing. The instrument is a perfect match with the optional FOB100-50FT software. 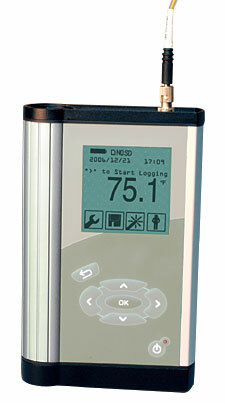 Software features include min/max alarm, full datalogging functions, and bar-graph, trend-line, or statistics display. Moreover, all system features are accessible through ASCII commands, facilitating the development of custom routines or proprietary drivers by users. The HHTFO-101 is a valuable monitoring tool for a wide range of applications in energy, industrial and research activities, such as hot spot monitoring inside power transformers during manufacturing and heat runs. It can also be used in various high voltage applications and MW/RF heating applications. Its accuracy and high degree of sensitivity to temperature changes makes it a natural choice for a wide variety of applications. The field-proven sensors are interchangeable and no calibration or inconvenient gage factors are required when changing sensors. The HHTFO-101 comes with a complete 1-year warranty. Nota: Comes with universal charger, 4 “AA” NiMH batteries, and operator’s manual.